A recent article in The Chicago Tribune estimated that one-in-four seniors, or 19 million people, are or could becomesocially isolated. Isolation can lead to depression, mental and physical health issues and even mortality. 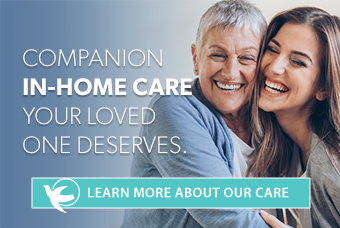 Visits from friends and family could help prevent isolation, but in many cases, professional home care may be a better option. Seniors are at a point in their lives where friends may be passing. Health issues can make it difficult for them to get around, so even if your loved one has many friends, it can be challenging for them to get together. Even if friends and family visit often, increasing numbers of seniors live alone and are thus in solitude at the end of the day. Thirty-three percent of people over 65 and half of seniors over 85 years old live alone. Not every senior who lives alone is lonely, but as more and more seniors live by themselves, more and more identify as being lonely. In 1980, 20 percent of seniors identified as lonely. Now that figure is 40 percent. Seniors can also become isolated, even when living with another person. Even a family member playing the role of caregiver, in particular, can be at risk of becoming isolated. If your mom is your dad's primary caregiver and spends most of her day looking after him, she's not doing the other things that she enjoys. Things like spending time with friends or other members of the family, passing the time with her favorite hobbies, attending social outings or even just getting out of the house to the hairdresser are still essential activities your mom needs in her life. If you believe your loved one may be depressed, talk to a medical professional. Isolated seniors are also at higher risk of medical problems. One recent study showed that isolated seniors were 29 percent more likely to develop congenital heart disease and 32 percent more likely to suffer a stroke. Isolation also disrupts sleep patterns, lowers immune systems and increases stress. Seniors with frequent social activity are 33 percent less likely to lose motor ability and 43 percent less likely to become disabled. It’s also been shown that a healthy social life can help to slow cognitive decline. Seniors who are frequently socially active are 70 percent less likely to suffer a reduction in their cognitive abilities. They may be 40 percent less likely to develop dementia. Another study in the Netherlands found that socially isolated seniors were at a higher risk, with a 64 percent greater risk of dementia. Loneliness and social isolation have also been identified as a possible factor in early mortality. One study showed that socially isolated individuals were 29 percent more likely to diethan those with more relationships. Another study claims that both social isolation and loneliness are factors in increased mortality rates for those aged 52 and over. According to the US Census Bureau, the average person moves 11.5 times in their life and one-in-four Americans has moved city or state in the last five years. With an increase in geographic mobility, the chance of families living close enough to drop in on loved ones multiple times a week is much lower. Local senior centers could also be an option for social interaction and might offer classes which can encourage your loved one to stay mentally active. But the ability to attend will depend on your loved one’s physical condition: Health issues might make it an impractical solution. Professional home care could also be an option. For seniors who are becoming isolated, companion care may be an ideal solution. In companion care, a professional caregiver will visit your loved one as little or as often as is required. The caregiver will offer company, compassion, conversation and reassurance. A caregiver might help your loved one with light tasks around the home, with meal preparation or give assistance to do the things he or she likes to do, like go for a gentle walk or play cards. A companion caregiver could be a lifeline to a senior whose family aren’t able to visit very often, and who isn’t able to get out and about as much as he or she did in the past. And if you or a loved one is becoming isolated because of caregiving responsibilities, respite care could help you or this person reclaim some normalcy. In respite care, a professional caregiver will visit and let you take time away from the daily grind of caregiving. If your mom takes care of your dad, a caregiver will sit with Dad in their home while Mom runs errands, visits friends, goes to the hairdresser or even just takes some well-deserved time to herself. Best of all, while the caregiver is with her husband, Mom knows he is in good hands and is free of the guilt that comes with leaving her husband to look after herself. And your Dad will benefit too, as he increases his social connections, spending time with someone other than your mom. It’s imperative that seniors stay social as the adverse effects of isolation on health can be severe. Encourage your senior to make connections and consider professional care if you are worried that your loved one isn’t getting the social stimulation he or she badly needs. Could connecting online help your loved one to stay social? This article offers some useful ideas.